After you’ve made the long journey and finally arrived in Hawaii, you not only want to lie on the beach, but also explore the beautiful nature of Hawaii. Here we introduce you to the possibilities of locomotion in Hawaii! The first thought, of course, falls on public transport. But only the bus traffic is really well developed on Oahu. So you can easily buy a bus ticket when getting on the bus. A single trip costs $2.75 and a day ticket $5.50 (December 2018). Each time you board the bus again, you will be counted as a single trip. This means that if, for example, you have to change buses to get to your destination, you will have to buy two single tickets. IMPORTANT: Try to get the money right because the bus drivers don’t give change! You just put the money into a box there. For longer stays you can also consider buying a monthly ticket. This costs $70 (December 2018) and is valid from the 1st until the end of the month. For example, you can buy a monthly ticket at the 7Eleven Store. Tip: Consider whether you will use the bus as often as you like. Also, don’t forget that the bus really does stop a lot, so you’ll need about an hour to cover a distance of about 30 minutes by car. Nevertheless, you have the opportunity to travel all over the island and always find a bus stop near you. This assures you that your holiday in Hawaii will be very spontaneous and that you are not constantly looking for stops. To make your holiday in Hawaii even more unique, you can also rent a car. You can get a normal small car for about $40 a day (December 2018) and you can rent it in advance on the internet. Rentalcars.com, for example, offer you low prices for a good service. For travellers under 26 years, the rental cars are much more expensive due to insurance reasons. But don’t forget, Honolulu is not a small city and especially during the rush hour times it’s not always pleasant to travel by car. In addition, you have to pay parking fees and fuel costs, which can make the rental car even more expensive. 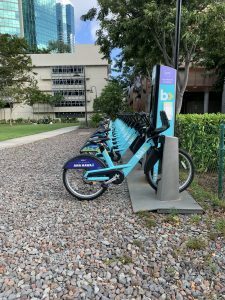 Another possibility for locomotion in Hawaii, which I consider very useful, is the bicycle rental Biki. So you are super fast on your way and you don’t need to look for a cheap parking place. You can simply rent a bike at one of the 130 stations and park it at any station. 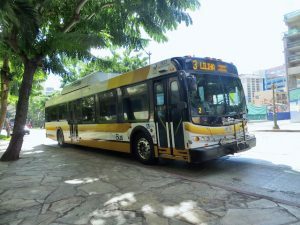 I recommend you to choose the offer with the 300 minutes, because you can ride through Honolulu without stress and time pressure. How the Biki works more exactly, you can read in our article “Cheap parking Waikiki”. Another possibility is Uber. Uber is similar to a taxi, but is usually a bit cheaper. All you have to do is download the Uber App and register. Afterwards you can order a Uber from wherever you are and enter your destination. The app will find drivers in your area and show you a price for your route. After confirmation your driver will pick you up and take you to your destination. The pre-determined amount will automatically be debited from your credit card after the trip. It is advantageous that the trip always stays at the same price, so it doesn’t matter if you are stuck in a traffic jam, taking a detour or anything else. You will be able to see the prices in advance, so you can’t be fooled, as with some taxi rides. As you can see, you have some options regarding the topic of locomotion in Hawaii. Of course it’s up to you which way you prefer. My personal tip is the bike. With it you are simply super fast and spontaneous on your way and not tied to any time. If you want to visit the island for a few days, you can also rent a car. If you are interested in a tour of the island, please visit DanielsHawaii or write to us on Facebook. We would be happy to show you the best spots on the island on a guided tour!